Life Is What Happens: Sign sign, everywhere a sign! Sign sign, everywhere a sign! Winter seems to bring out the signs. You know, the ones that say, "Wet floor, be careful." It's wet, no doubt, from all the slushy boots that melt, as people stand in line for coffee or something dryer :) Or the signs, that say, "Use at your own risk," for all those stairs that are never cleared in winter, because people aren't supposed to walk in winter, right? 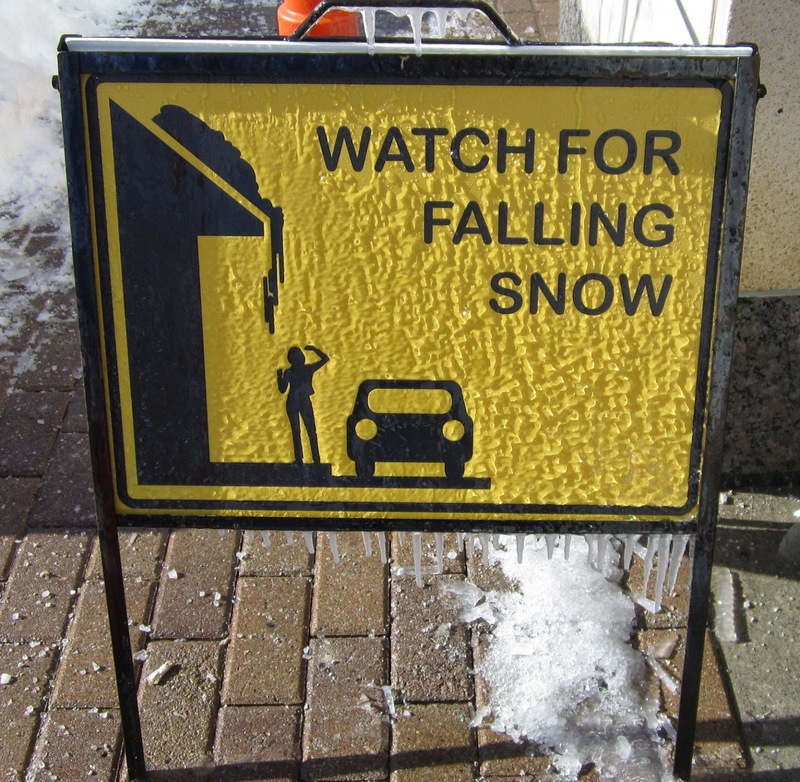 And then there is the sign I saw yesterday - "Watch for falling snow." It is both hilarious and totally absurd. I walk to work, so I constantly have my eyes on the ground looking for black ice. That's the ice that masquerades as, "hey, I'm just your average sidewalk," until you slide all over it!! So I'm not really in a position to be looking up for all the snow and ice that may be falling from the buildings above. Anyway, how many people have you seen lately walking around with their heads tilted back looking for falling snow. I can tell you, no one does this in a snow storm and if it's after the storm, you still look ridiculous looking up for what may, or may not be, snow that's falling down. You also look particularly ridiculous, if while looking up, you fail to look down and well, you know, fall down!! I think there must be an Ogden Nash poem about this. It's the one right after the one about "pushing doors marked pull" - "looking up, when you should be looking down, may make you a bit of a clown" - or something like that." Insurance companies probably note, in the fine print, that, in order to be covered by the policy, policyholders need to warn people about all the dangers inherent in daily living, that may occur on their insured premises. These insurance companies, though, fail to realize that people don't normally go around in a multitude of twisted body shapes just to appease an insurance adjuster. OK, even if he is the Johnny Depp of insurance agents, I am not going to get whiplash from jerking my head up and down to minimize the danger of falling snow, while maximizing the danger of sliding on slick ice.